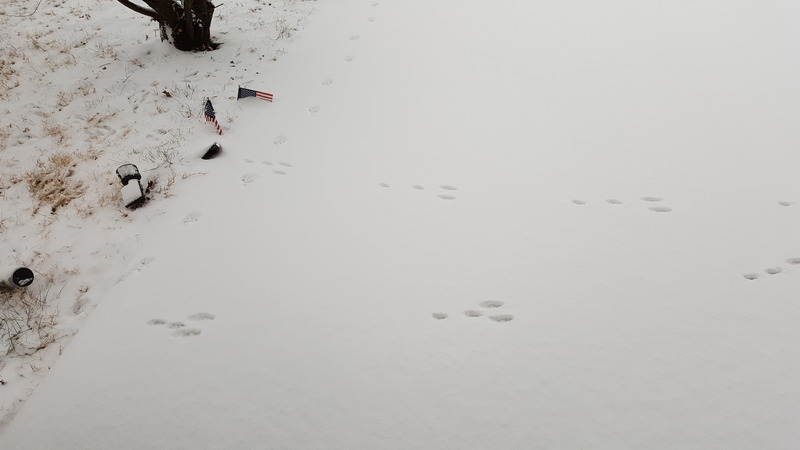 Nature lovers, can you identify these footprints I saw going across our driveway this morning? They go on and on like this. Left to right, a rabbit, definitely. The ones on the side going up, possibly a deer (if they have two parallel grooves, I can’t really tell very well). Definitely a rabbit! They make a nice pattern don’t they? Now, important question. Should I leave food out for them. Carrots, for instance? It Will be -10°F tonight. Carrots are a treat for rabbits, not real food. I briefly had a neighbor’s rabbit and learned when researching the topic that carrots are the equivalent of cotton candy for them. You could leave lettuce or alfalfa pellets for them, which are available from any good pet or feed store. Rabbits, I agree – and there’s never just one wild rabbit. They will eat carrots, fruit and vegetable peelings, beyond that I’m not sure. In your position I’d feed them while it’s seriously cold, but don’t feed them regularly unless you want them to take up residence. They may not need much encouragement to stay, as you don’t keep dogs or cats. Rabbits are very charming to watch, but will eat all sorts of plants you may not want them to eat. They will probably dig holes as well if the ground isn’t frozen and you can’t tell them where to dig! Anyway, do enjoy them if you see them, and Klara might like to see wild bunnies.